Bob Feller Autographed Photo Indians 16x20 #1105 2 Inscriptions | Sports Memorabilia! Bob Feller Indians 16x20 #1105 Autographed Photo. 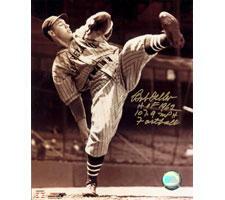 This is a great photo of Bob Feller's high kick wind-up. His autograph is accompanied by two special inscriptions "HOF 1962" and "107.9 MPH Fastball". Bob Feller was also know as "Rapid Robert" for his amazing speed of a fastball. His fastball was officially measured at 107.9 MPH. The autograph and the special inscriptions are in gold pen on this brown tone photograph. A NSD numbered hologram and NSD certificate of authenticity is included. A NSD numbered hologram and NSD certificate of authenticity is included.